Such a photo only heightens concerns as to the direction Greg Laurie (one of Calvary Chapel’s most popular pastors) is taking the church. In 2012, Chris Lawson (a former Calvary Chapel pastor, now a Lighthouse Trails author) wrote a report about a book titled Have Heart (which is the story of pastor Steve Berger and communication with his deceased son). Even though the book encouraged necromancy, it was endorsed by Greg Laurie. 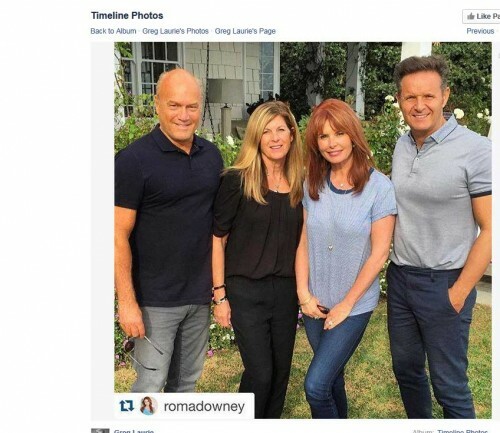 In author Greg Reid’s booklet, Confused by an Angel: The Dilemma of Roma Downey’s New Age Beliefs, he documents that Roma Downey is aligned with the New Age. That, though, has not deterred Christian leaders, such as David Jeremiah and now Greg Laurie, from showing comradeship with Downey and Burnett. To understand a fuller scope of our concerns about Greg Laurie, refer to the articles from our archive below.